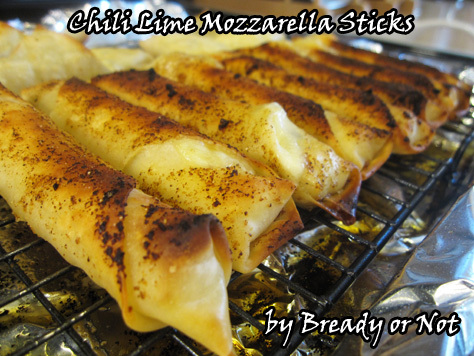 These dressed-up mozzarella cheese sticks are delicious hot or cold! Unwrap mozzarella sticks and freeze for 1-2 hours. Do this on wax paper so they don't stick. Whisk together the chili lime olive oil ingredients in a small bowl while the oven preheats to 400 degrees. Wrap your sticks. Follow the directions on the package or you can Google it. Be gentle so you don't tear the thin pastry, and do remember to brush water on the edges so that it seals. Note that you likely won't have 24 wrappers in the pack, so count them and be prepared to eat some naked cheese or do some double-wrapped versions. Place the wrapped cheese on a baking rack placed on a foil-lined baking sheet. Stir the seasonings again (the spices will settle) and then brush the oil all over the cheese sticks. Use up all that good stuff. Bake for 15 minutes at 400-degrees. Adjust the rack and broil for 3-5 minutes, or until golden, then flip them to broil the other side. Eat up! They are amazing fresh--dip them in the oil in the pan. Serve with salsa or guac. Also, these things are amazing cold out of the fridge, if you happen to have any leftover.